The Trump administration plans to kill the Clean Power Plan, the Obama administration's main initiative to fight climate change by lowering emissions, the Environmental Protection Agency's administrator, Scott Pruitt, said Monday. The Clean Power Plan aimed to help the US reach the goals set in the Paris climate agreement by curbing emissions from power plants. Pruitt has reportedly spent much of his term meeting with executives and lobbyists from companies and industries regulated by the EPA. Many reports also suggest that Pruitt's primary aim is to eliminate environmental protections and dismantle much of the regulatory agency. Under Pruitt, the EPA has already reversed a ban on a pesticide that can harm children's brains and moved to rescind the Clean Water Rule, which clarified the Clean Water Act to prohibit industries from dumping pollutants into streams and wetlands. The agency has also reportedly begun an initiative to challenge climate science, among other rollbacks. Some of these moves have been challenged in court, but others are already in effect. If Pruitt succeeds in rolling back a significant portion of the rules meant to protect air and water quality, we'd return to the state the US was in before these things were regulated. The EPA was founded in 1970 and soon after began a photo project called Documerica that captured more than 81,000 images showing what the US looked like from 1971 to 1977. More than 20,000 photos were archived, and at least 15,000 have been digitized by the National Archives. Many of these photos show life in America at the time, but several also document concerning environmental issues. David Shanklin, pictured here at age 19, lived in a coal-company town near Sunbright, West Virginia. Shanklin's father was killed in the mines in 1954, and though Shanklin wanted to become a miner, his mother didn't want him to. Smog, seen here obscuring the George Washington Bridge in New York, was a far bigger problem. Factories burned discarded automobile batteries in the 1970s, releasing pollutants into the air. Current regulations require the batteries to be recycled without contaminating the surrounding area, though some are exported. Mary Workman of Steubenville, Ohio, holds a jar of undrinkable water from her well in this photo. She filed a lawsuit against a coal company, accusing it of polluting her water. The EPA now uses the Clean Water Act to prevent companies from contaminating drinking water. Air pollution that can cause respiratory illness and other health problems was far less regulated before the EPA was founded. The EPA estimated that the Clean Air Act, which regulates pollution from industries, prevented more than 160,000 early deaths, 130,000 heart attacks, and millions of cases of respiratory illness in 2010 alone. Coal-mining companies were bigger polluters in the 1970s as well. President Donald Trump has pledged an industry resurgence and recently nominated a coal lobbyist to be Pruitt's second-in-command at the EPA. This photo shows a burning barge on the Ohio River in May 1972. A fire on the Cuyahoga River in 1969 (the 13th time that river had caught fire) helped to inspire the creation of the EPA. The agency helps regulate cleanups in particularly polluted sites. The Twin Towers are visible behind the trash heap in this image. Trash and old tires littered the Baltimore Inner Harbor in 1973. The EPA regulates waste disposal now, including in coastal locations. EPA cleanups in the harbor over the years have targeted dangerous chemicals. All kinds of trash used to be dumped outside New York City, like this car at Breezy Point, south of Jamaica Bay. The EPA helped institute regulations for how the city disposed of trash to prevent dumping in the Atlantic. Without regulation, more companies and manufacturers would be able to dump pollutants into waters and the air we breathe. 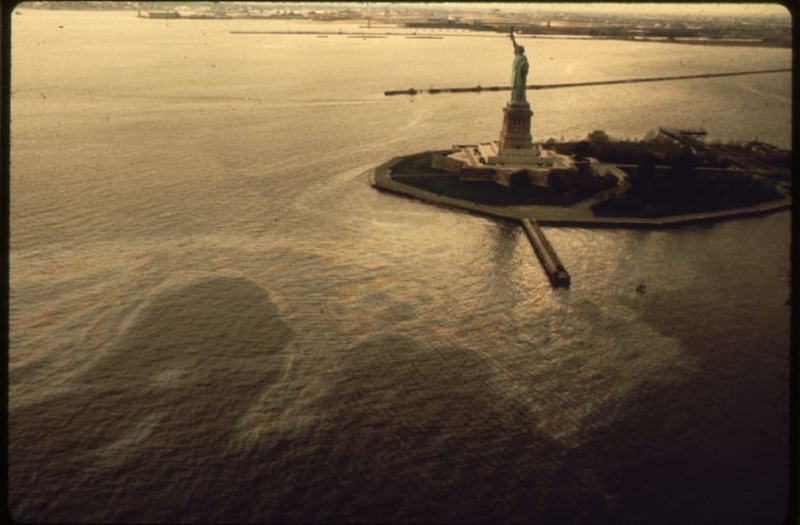 An oil slick surrounding the Statue of Liberty.